My THANKS to the Forum below and its members for showing this guide. By following the below i succesfully Hacked my Scope to 100Mhz. I had so many questions, and was apprehensive to upgrade the FW unless I felt confident it would work (again, thanks to Straycat and Hammy). Upgrading FW on $50K to $100K hardware is a normal part of my job at work, and I am always cautiously nervous each time (even though the hardware at my work is under support) because upgrading FW is usually the point when things go wrong, it will brick the equipment. (note, I doubt you’d get warranty repair if you upgrade your DS1052E and it bricks it, so do at your own risk and make sure you’re comfortable with doing it). For those with the same extended system info as mine (to start) should gain some confidence that the hack does work. You have to get into an “extended system info menu to see this information by selecting the “Utility Button”, scroll down to “system info”, select CH1 twice, CH2 twice, and MATH once. (I also wanted a copy of the original 50Mhz FW to compare to). I formatted the USB drive to FAT32, and copied the DS1000EUpdate.RGL FW file to it, and then I checked the hash (I can’t stress how important this is) AFTER it was on the USB flash drive to be double sure it was non-corrupted. Once I inserted the USB drive, the DS1052E recognized it right away and asked me if I wanted to upgrade (even though it was the same version – but was the hacked one), and I selected yes and after it was done restarted the scope. After the reboot of the scope, you can tell if the hack was successful by going to the horizontal scale potentiometer, and turn it all clockwise all the way and it should stop at 2.000 ns (the 50Mhz scopes stop at 5.000ns). 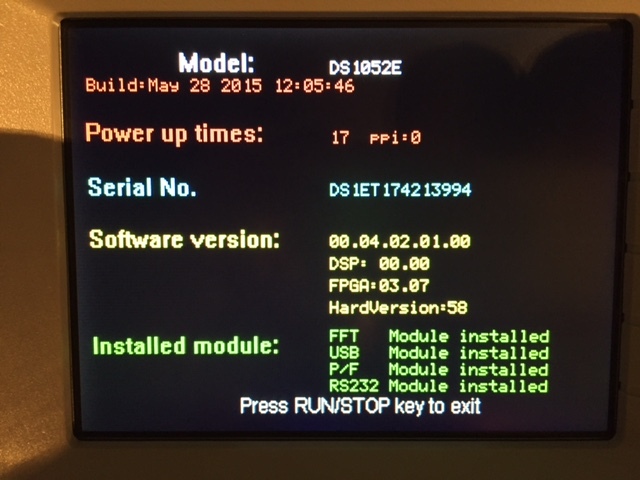 Also note, this FW hack does not affect the serial number, nor the DS1052E model, which all remain the same. This is most likely good, as should you have warranty issues, and have to send it in, perhaps they may not notice (however the SN/model change, they definitely would notice)? Just make sure if you view in a hex editor you don’t accidently change any value without knowing, and double check the md5 checksum after to be sure. Anyways I wanted to review this, since this thread is so long, and there is actually very valuable information thanks to a few very nice people, and it can be a bit tough to find (although working through the thread helps understand how things started and ended up with this FW hack method). Could anyone please doublecheck and confirm to build a “net of trust”?